Our 12" x 16" Tempered Glass Cutting Boards are a Great Addition to Anyone's kitchen. Makes a great gift, even for that person who's hard to shop for. 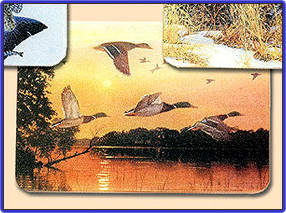 REP-741 Cutting Board - Mallards in Flight over Sunset Background. This Beautiful Tempered Glass Cutting Board are constructed of Tempered glass, and features a Large 12 x 16 Cutting Surface. These decorative counter top savers come in a variety of fish and wildlife scenes. Heat-Resistant, Stain-Resistant. Will not burn or scorch, even with the hottest pans. Scratch-Resistant Safety Tempered Glass. Smooth Surface for Easy Cleaning. More Sanitary than plastic or wood. Dishwasher safe. 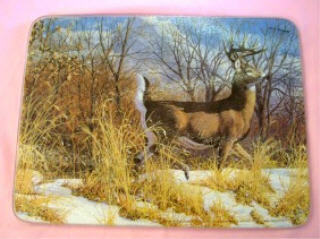 REP-742 Cutting Board - Whitetail Deer (Pictured above Right) Features a large 12" x 16" Tempered glass cutting Surface. Beautiful Scene of a Whitetail Buck Trotting along of the edge of a field. These decorative counter top savers come in a variety of fish and wildlife scenes. Heat-Resistant, Stain-Resistant. Will not burn or scorch, even with the hottest pans. Scratch-Resistant Safety Tempered Glass. Smooth Surface for Easy Cleaning. More Sanitary than plastic or wood. Dishwasher safe.